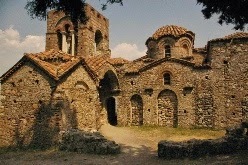 Agia Sophia was built by the first Despot, Manuel Kantakouzenos Palaiologos circa 1350, almost immediately after Mystras had became a Despotat. It was intended to serve as the palace church and was erected in the upper town just above the palace square (1). 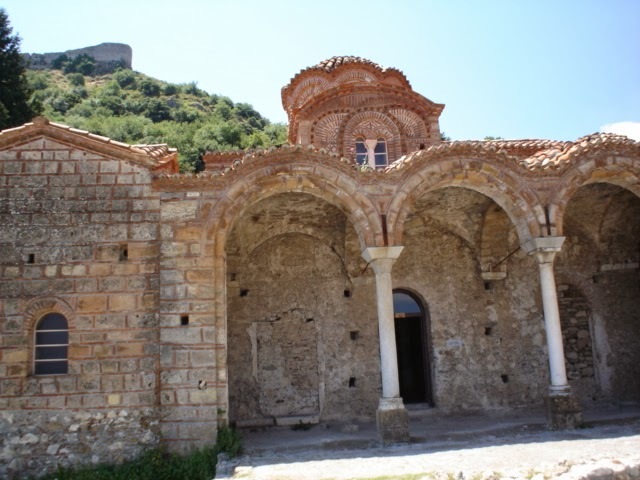 This was a moment when the Despot would have wanted a church to reflect to some degree his imperial connections and the new importance of Mystras. So he called it Agia Sophia, (the Church of the Holy Wisdom), a name quite deliberately echoing its famous namesake in Constantinople. That is such a good beginning and every guide book starts with it. But a few sentences later the fact that it was turned into the katholikon of a monastery by Patriarchal decree in 1365, just a few short years after it was built, has to appear– that and the fact that it also seems to have changed its name. Murky Mystras: just when you think you have a straightforward story to tell, it throws you a curve. Why such a short shelf life as a palace church? Why change the name from Agia Sophia to Christ Giver of Life (Ζωοδότη Χριστού)? the Palaiologan crest, the inscription Manuel Kantakouzenos Palaiologos, Despot, Ktetor (κτήτωρ) is written on the capitals of the pilasters near the narthex. This word ktetor needs a little explanation. 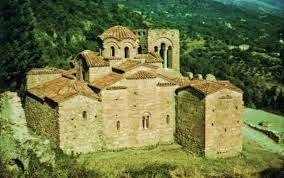 As Ktetor, Manuel would have had property rights, first to the church, and later to the monastery. He would have been able to choose the abbot, and to pass the monastery and its possessions on to his inheritors. Note also that the Patriarchal decree turning the church into a katholikon would have meant that the new institution was not obliged to pay local taxes. Monasteries, with their attendant properties, could be a safe investment. Two marble columns on the west and the two piers that are part of the sanctuary to the east with the east arm of the cross as the sanctuary vault. Simple does not mean uncomplicated. The black lines in the next photo outline the “distyle cross-in-square” part; it sits in the middle of a series of add-ons: four chapels, a domed narthex to the west (left), a portico, and that square Frankish looking bell tower that although attached to the church, looks as if it is quite ready to make the move a few metres sideways or forward and become a separate architectural entity. 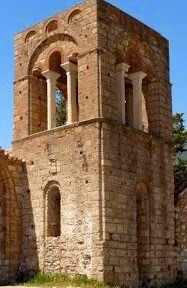 Separate bell towers were one of the few Frankish architectural innovations to eventually catch on the in Peloponnese. you will see that the elongated effect inside is very pronounced. 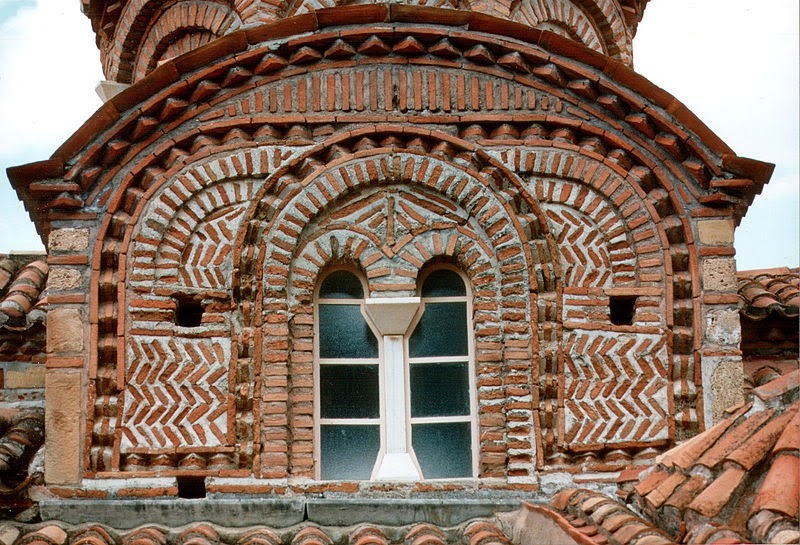 Of course, the Hodegetria - Aphendiko had introduced these much admired Constantinople-style high apses to Mystras already. Some see this emphasis on height as a western influence. Certainly by this time there was a stylistic fusion happening between east and west. The church once had porticos on three sides, another feature of the capital city first introduced by the Aphendiko. The north one was reconstructed by Professor Orlando after 1938. Manuel apparently also had portraits of his parents, the Emperor John VI and Irene Asanina in front of the entrance as well to remind anyone entering of his close connection to the ruling dynasty. All visitors today pass through the portico in order to enter the church. The other two have not been reconstructed. The chapel on the left is believed to have been used as the royal burial chamber. With that picture in mind, it is worth noting here that the dome on the narthex, while still not as high as the arms of the cross on the main church is somewhat out of proportion – too big for its boots, so to speak. I have no idea why but it suggests a builder either not completely comfortable with the accepted style, or maybe just a would-be trend setter. The western façade of this church just does not seem to match the more carefully built eastern and northern facades. Notice the somewhat clumsy rubble masonry used in the walls. Perhaps the portico which was once in place made up for that? 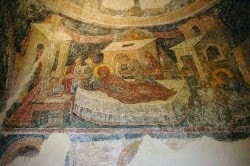 Were the walls frescoed? Whatever the reason, all of the masons’ care seems to have been lavished on the rather austere apses and the north-east chapel where the cloisonné masonry is elegant in its simplicity, and on the arms of the cross. The church’s bell tower has been called ‘elegant’ by some but I can’t see it. It was originally one storey higher. It is more elegant than the one on the Metropolis certainly, but still top much like a castle keep to be called truly elegant. There has been some effort to soften the effect of the top half but that is a reconstruction. When the church was turned into a mosque by the Turks, this became the minaret. Not very elegant then either! 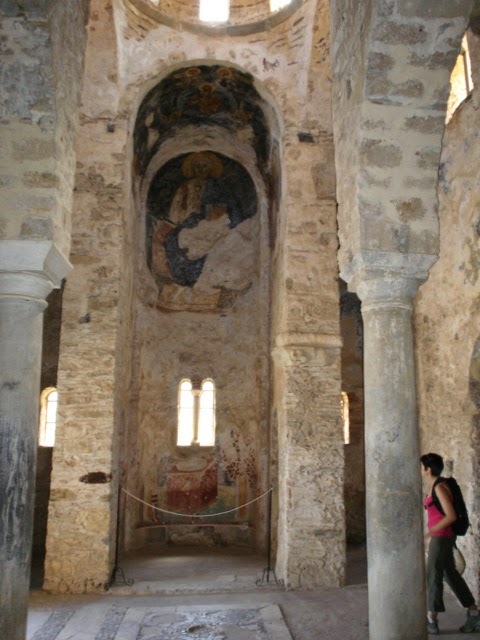 The outline is the same but the restorer must have just visited the wonderfully oddball Church of Agia Fotini in Mantinea. That frenzied zig zag brickwork is odd. Kind of nice though. Because of the dome’s collapse and reconstruction, the main church has a scoured look –so much of it has been peeled back to the brick work. Its transition into a mosque would not have boded well for the wall paintings in any case. Sometimes the Turks destroyed or mutilated them. In the best case scenario, they whitewashed over them. There is a beautiful square piece of the original flooring still in place. 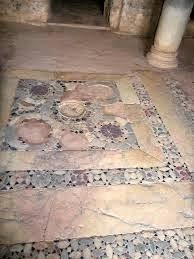 A good deal of attention and artistry went into the original floor. The geometric patterns and colours are lovely. That Ascension on the vault of the east arm of the cross is exactly what you would expect, but Christ in the conch of the apse is a poser. It should have been Mary in one of her many guises, but it is not. It is this icon rather than any safe written record that has made scholars believe that Agia Sophia and the “Christ Giver of Life” monastery both known to have been sponsored by this Despot are one and the same. Perhaps Manuel turned the church into a monastery with the intention of becoming a monk as his own father had done in his last years – or perhaps, as touched on before, it was just a wise investment. Note the griffon on that fragment of the iconostasis to the right. There were still lots of ancient marble bits available in 1350 even after the Metropolis and the Aphendiko took their share. 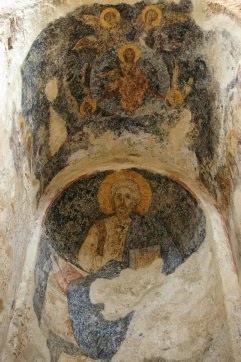 All of the frescoes date from the period of 1360+ to 1400. The two eastern chapels fared better than the main church. The North east chapel which must have been a funeral chapel (a 15th century tomb was found inside) is better preserved on the outside than the inside. 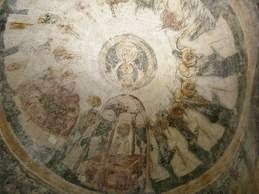 The frescoes follow a program you would expect in a funeral chapel: Christ surrounded by Angels, Principalities and Powers in the vault (ceiling) and two large archangels dominating the walls . There is also the Crucifixion, a Dormition of the Virgin, and a Harrowing of Hell. Note the birthing bed is the ‘same’ type she will be laid to rest on in the ‘Dormition’ icon. Orthodox icons love such symmetry and symbolism. There is a quite impressive enthroned Christ on the north wall and the vault has a rather pint sized Mary surrounded by angles in the Divine Liturgy. This particular icon is called Mary Blacherniotissa after the church in the capital where the original icon was kept. In this guise, she is depicted sitting with Christ (sometimes in a medallion) on her lap. There is a family connection with the church of Blachernai in Constantinople. It too was a palace church and, in fact, the Despot Manuels’ own father John VI had chosen to be invested there. So there might have been a very personal reason for choosing this particular icon in this chapel. The fact that the north western chapel was used for burials has been mentioned. There is a crypt. Manuel himself is not buried here but some think it was for royals and tradition has it that Theodora Tocco, first wife of Constantine Palaiologos and Cleopa Malatesta, wife of Theodore Palaiologos, were buried here. There was once a two story refectory north west of the bell tower. You can still see the walls and niches. A refectory was a chapel in its own right with a table or tables in the ‘nave’. Full length figures of saints can still be discerned. Farther west were other small buildings and beyond that an underground cistern which is still quite undamaged and a reminder that the upper city from the palace upwards, did not have fountains. It was too high to bring water from the surrounding hills using just gravity and ingenuity. 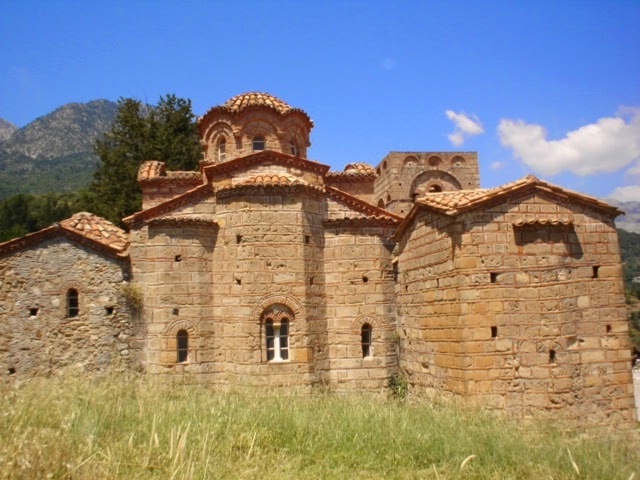 This monastery, the surrounding houses and the castle all had to depend on rainwater storage as did so many other citadels in Greece.